Posted October 26, 2015 by Ian McArdell & filed under DVD & Blu-ray. With this DVD release, all the surviving Doctor Who episodes in the BBC archive are now available for fans to own. 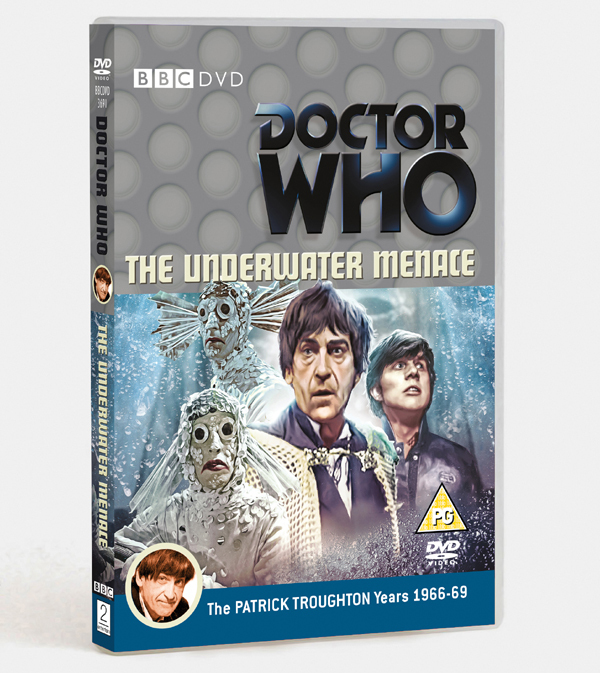 Returned to the BBC in 2011, along with the third episode of ‘Galaxy 4’ (available on ‘The Aztecs’ Special Edition), ‘The Underwater Menace’ has endured a complicated journey to the high street. Frankly it was somewhat overshadowed by an arguably more exciting find; the story was originally slated to arrive with animation to cover missing first and fourth episodes, then the DVD release was cancelled – sparking an online petition – and finally reinstated. With the gaps covered by stills and audio, we can now enjoy half the story in it full glory and make a fair stab at imagining how the rest might have looked. The tale, from a prolific film screenwriter but first time Doctor Who scribe Geoffrey Orme, is remarkable. Part prison break, part political power struggle, it sees the Doctor battling against a mad professor intent on raising Atlantis by draining the sea. Atlantis survives by farming plankton as a food source, thanks to converting people into a slave labour force of Fish People. The Atlantean leader believes Professor Zaroff to be their saviour, although he has other plans. While the purchase might appeal to that completist gene that runs rife through many Who fans, and though the story might be a little (ahem) fishy in places, it is essential viewing for many reasons. With the two preceding stories missing, this is our first look at Patrick Troughton as the Doctor. Still finding his way into the role and indulging in plenty of fun with costumes with a beggar’s outfit and a fantastic headdress, he’s wonderfully charismatic. It is also Jamie (Frazer Hines) first trip in the TARDIS, having been brought along after ‘The Highlanders’ and added to the gang of Ben (Michael Craze) and Polly (Anneke Wills). Some elements do not work well; the Fish People are frankly bizarre, we imagine a product of the costume run riot, and their floating ballet sequence from Episode 3, though ambitious, fails to achieve. There are also some highly dubious eyebrows on the male Atlanteans! Among the guest cast, Catherine Howe is enjoyable as the sympathetic Ara, who becomes a pseudo-companion for the tale, and the big, big performance of Joseph’s Furst does not disappoint. The story is equipped with a host of extras. Archive interviews, including one with Patrick Troughton himself, feature on the missing episodes, while the surviving eps are discussed by Frazer Hines, Anneke Wills, Catherine Howe and Assistant Floor Manager Quentin Mann – moderated by Toby Hadoke. Peter Davison narrates ‘A Fishy Tale’, a documentary on the making of ‘The Underwater Menace’, with the surviving cast giving their perspective while writer Rob Shearman provides a knowledgeable voice of sanity, placing elements of the production in context. ‘The Television Centre of the Universe – Part 2’ is an look behind the scenes of TVC, starring Peter Davison, Janet Fielding and Mark Strickson, hosted by former Blue Peter presenter Yvette Fielding. While her contributions are at times banal, asking the dreaded “Who was your favourite baddie”, she does also elicit some interesting memories, such as the moment when Tom Baker attempted to give Peter Davison advice on taking on the role. In fact, while it is nice to see the show’s stars, in this instance the production staff’s memories and thoughts are somehow more touching. Released on DVD on Monday 26 October 2015 by BBC Worldwide. > Order ‘The Underwater Menace’ on DVD on Amazon. I don’t even care if it’s any good now. I’m going to get it (my birthday on Saturday, that’s good timing) and I’m going to enjoy it on principle. It could be absolute garbage but I don’t care about that now after waiting for so long. It’s about bloody time they released it. The long and tedious journey these episodes have taken to DVD is disgraceful. Let’s not delay like this again BBC, I hope you’ve learnt from this. As much as I enjoyed the story – and the recons are a struggle, especially episode 1 – the archive interviews with Troughton & Innes Lloyd, as well as a present day one with Michael Troughton about his father’s work, on the commentary soundtrack are a real treat. Let’s just hope they find something more to release!